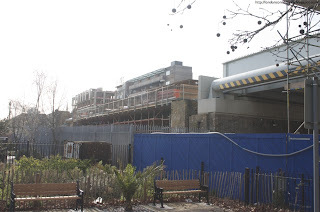 West Hampstead station will be rebuilt with lifts, a new entrance, ticket gates and cycle parking. I'd think the entrance will be further south. The pavement on the west side of West End Lane will be widened and the road crossing to the Jubilee Line will be improved. 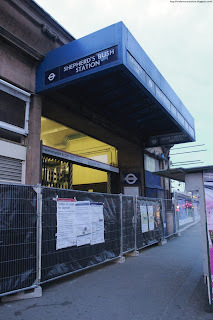 The North London Line station will get a "modified entrance" and lifts. There will be two "associated mixed use developments" to pay for it, which they also say will "improve the public realm". The timescale given is 2011. In the mean time, they plan platform canopy renewals, extra information screens and and canopies over the ticket machines (and one extra) during this year. This is far less ambitious then the previous plans, which were championed by Chiltern Railways, and potentially included a rebuilt tube station with Chiltern and Metropolitan Line platforms, relocating the NLL and Thameslink stations to the east side of the road, and an off-street interchange bridge between them. We would demolish the gyratory system [at Marble Arch], handing part of it back to green land and building two developments on part of it which will fund the project. People getting a taxi would have to use the roads running north and south of Oxford Street. We would phase the buses out slowly and maybe run some along Wigmore Street. You can find a few more details in this Evening Standard piece, which mentions a £200m cost and a 2012-18 timescale. The article quotes statistics from this New West End Company press release, who sponsored the debate, and are major backers of the proposal. Ken discussed much the same idea in 2006. Sad news for fans of prog rock, white rap, and barely used shuttle buses for which it's quicker to walk or take the normal bus. They must now have at least three delivered, as the one I saw last week was number 104, and the very first delivered was allegedly 105. The elimination of Cheap Day Returns is causing problems with fare anomalies at Richmond, Watford Junction, West Hampstead and others. They plan to reintroduce them from Richmond in February and do some unspecified fiddling in May (This should please diamondgeezer). First Class fares are to make a comeback for journeys where London Midland or Southern have it available. Richmond to Stratford on Oyster PAYG is still charged as via Z1, regardless of route. They plan to review anomalies like this in May, and "there are also likely to be two different fares depending on the route", though I've no idea how that will work. Oyster PAYG take-up and revenue in general has been much higher than expected. There's no Oyster ticket machine at Clapham Junction due to objections from South West Trains, so a local newsagent is doing a brisk trade (this was thought to be resolved in October, but apparently not). The original order was for 44 trains, a mix of 3 and 4 car trains and a total of 152 carriages. They then ordered three more whole trains plus extra cars to make the fleet all 4-car, taking the total to 188. The latest news adds an apparent 7 more trains and brings the total to 216. A brief mention of a follow-on order did appear in the recent board papers, but this the first indication of its size. 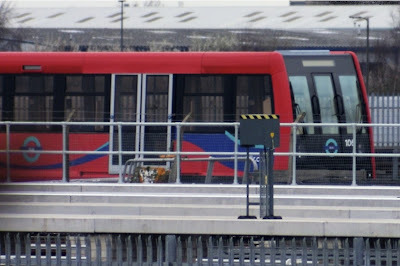 The first car of new DLR "B07 stock"* was delivered nearly two months ago, but unless my Google skills are failing me no pictures have appeared online yet. So I've been to Beckton to get some myself. From this distance at least it doesn't look as radical as in the artist's impression. The only obvious external differences are the curvier front end and full height windows in the doors. The livery has gained a black stripe along the windows and light blue bits on the swooshes. They have a mockup of new front end design at the London Transport Museum, which shows it better than I could. A public exhibition of the new units is planned for "this month", and some of them should be in service during the first half of this year. 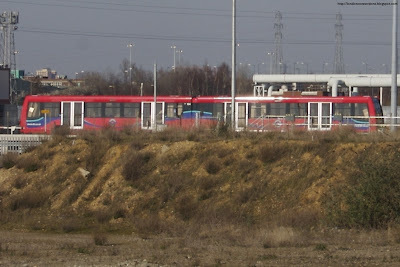 The new units are to expand rather than replace the existing fleet, necessitated by the opening of the City Airport/Woolwich Arsenal branch and the plans for 3-car running. The latter is being partly paid for with Olympic funds. * Or B09 or C09, depending on who you believe. They plan to rip out the end seat of the appalling 3+2 seating to make it 2+2 plus a wide aisle for standing. This will start as soon as they get approval that the trains can take the extra weight of standees. The new rolling stock will have "30% more capacity" per train. Each carriage is longer and doesn't have the big guard's area behind each cab. The Mayor and the Secretary of State have discussed the opportunity presented by the expiry of the Southern TOC franchise in 18-months time for TfL to take a greater role in its future. TfL and the DfT will now work on the extent to which the inner suburban services, trains and stations can be enhanced to the standard of Overground and how TfL can be given a greater role in the running of the future franchise. From the start of the new Overground services from West Croydon and Crystal Palace in June 2010, stations between these stations and New Cross Gate will be staffed and managed by London Overground. 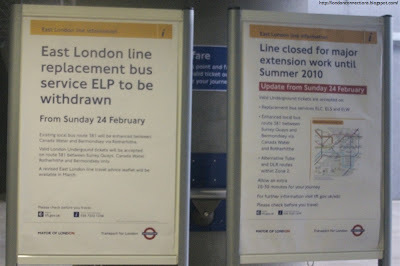 The South London Line (SLL) stations could also transfer when Overground services commence upon completion of East London Line Phase 2b to Clapham Junction, subject to agreement on funding. So either they're keeping quiet about what their ambitions are, or there's not much serious change planned. 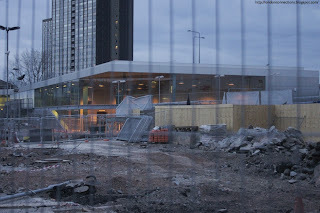 A new station at Shepherd’s Bush on the West London Line (WLL) has been constructed by Westfield together with Network Rail, prior to TfL taking over responsibility for Overground services. 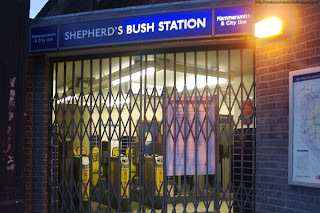 It was hoped that this would be opened in time for the start of London Overground services, launched by the Mayor on the 12 November. However, the north-bound platform has insufficient width, given projected passenger levels. Dialogue has taken place with Westfield and Network Rail with a view to rectifying this situation by moving the platform retaining wall and widening access to the platform. It is hoped to provide an opening date once the project plan has been completed. It is estimated that the work will take 4 months following agreement to provide. That puts the earliest opening possible opening date as mid-Summer. 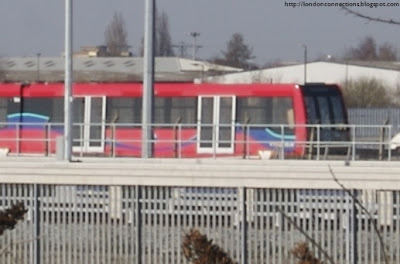 User Class 50 on Flickr has photos of progress on the DLR station at Stratford International. One shows the station box close up (ignore the mentions of Crossrail in the caption). For context, check out this wider shot and the project map. The station is deep inside the Olympic exclusion zone, so you're not going to see photos like this very often. There's been some confusion over whether last night's fire in Camden did any damage to the North London Line. I happened to be in Camden last night so I couldn't resist going for a look. I've made a map showing the area affected. 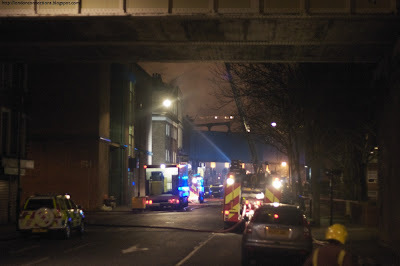 The bridge in the foreground carries the North London Line and is a safe distance from the fire. The bridge in the centre is the freight link from Camden Road and South Hampstead via Primrose Hill, which was in the middle of it. Update: I've just been through on the already-reopened North London Line, and the other viaduct looks fine. Three schemes remain under review in spring 2006. These are Bank – Farringdon, Bank – Liverpool Street – Shoreditch (Bishopsgate Goodsyard site), and Bank – Charing Cross. The Charing Cross scheme has been widely discussed and even appears on one of the Crossrail maps. The other two are complete news to me. The route to Farringdon would surely involve the abandoned Thameslink tracks from Moorgate, and the route to Liverpool St would be a logical extension of the overrun tunnel that already points northeast. Of course I have no idea if any of these are still being considered, but it's interesting to know they were at one point. The government have made an announcement regarding whether Crossrail should terminate at Reading rather than Maidenhead. I have now decided to safeguard additional land between Maidenhead and Reading. While I am clear that Crossrail services will terminate at Maidenhead and have no plans to extend them to Reading, this measure gives the flexibility to be able to extend Crossrail in the future, should there be a business case. While there's a prevailing opinion that Reading is the more "logical" place for services to terminate, the Crossrail people argue that it would be too expensive since "the first station where Crossrail would be likely to pick up considerable passenger traffic would be at Maidenhead". However, the biggest expense is the rebuilding of Reading station, which is happening anyway, making some regard an extension as the inevitable next step. There'll be various local, semi-fast and fast services in addition to Crossrail, so most passengers will be well-served whatever happens. At the other end of the line, the statement mentions an extension from Abbey Wood to Ebbsfleet in Kent is already safeguarded. The safeguarding actually continues all the way to Hoo Junction on the other side of Gravesend, where a depot would be located. They say they're considering updating the safeguarding in some way, though there's no mention of how or why. 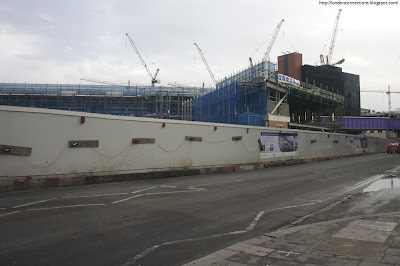 Continuing my run of posts about Shepherd's Bush, here's a picture of construction progress on the new Wood Lane station, on the Hammersmith & City Line at the opposite corner of the shopping centre from the other stations. Due to open November this year, looks like it will. No snarking about platform width. There are indeed some issues regarding the safety of the narrow northbound platform which must be resolved before the station can open. London Overground Rail Operations Limited, the operator of London Overground, have identified potential risks to passengers as trains pass at high speed. As the station is owned by Network Rail and is being developed by Westfield (the developers of the shopping centre), it is their responsibility to ensure that safety requirements are met. What's implied is that Network Rail and Westfield are (or were) happy with the station as it is. The "built too narrow" farce angle may make a good headline, but it appears there's a genuine dispute about whether or not the platforms are safe. Please be re-assured that TfL and LOROL are in regular contact with both parties, with a view to resolving these matters as soon as possible. At the moment, frustratingly, we are unable to confirm an opening date. London Rail has designated a senior manager to monitor developments, and both the Project Director at Westfield and the Network Rail director with responsibility for this station are working closely with him to determine a solution. There's a tiny bit of hope something's happening. I had a look last weekend and nothing's changed. The current wording on TfL's project page is "due to open shortly". 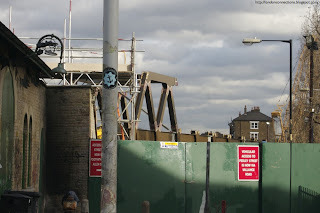 Time for another look at East London Line construction progress. You might want to look at the last one and the map of Shoreditch first. 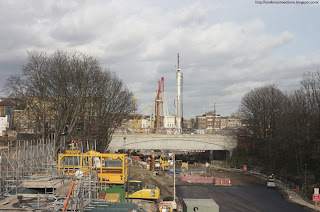 We'll start with the dreaming spires of Dalston Junction - it recently gained a huge assortment of cranes, drills and piling rigs poking out of the station cutting. The trackbed has been tarmacced to allow road access, via a gate on the north-south bit of Richmond Road. They've only just started serious work here, and given the complex plan for the site it's likely to be the last bit to be completed, determining when the line opens. Next, Haggerston station. They've demolished a couple of viaduct arches to build the station entrance. 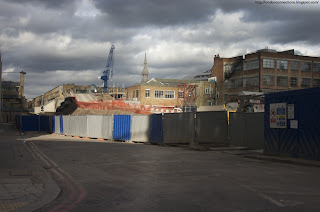 The site of Hoxton station. Nothing much to see yet. The bridge over Shoreditch High Street. The rebar for the abutments on either side is almost complete (left photo, surrounded by scaffolding), and a big bit of bridge deck has been delivered to the site. It'll be very similar in design and size to the new bridge over Regent's Canal between Haggerston and Hoxton. After going through Shoreditch High Street station (which hasn't changed much since last month) and crossing Brick Lane, we come to the bridge over the Great Eastern Main Line. The abutments were just frames last month, but now they're solid concrete. 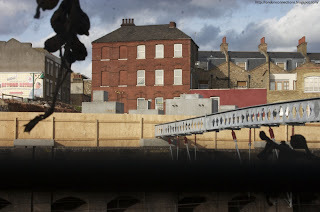 The massive framework for the bridge looms over the old Shoreditch station, with Weaver House in the distance. It's a lot like the bridge over Kingsland Road, but twice as long and, carrying only two tracks, half as wide. Or, if you're an optimist like the Watford Observer, it just "edged closer to approval". Hertfordshire County Council have just rolled the dice once more by submitting the project's business plan to the Department for Transport, in their latest bid to get the required funding. 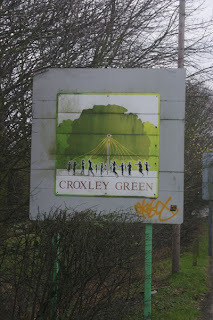 They want £95 million to divert the Watford branch of the Metropolitan Line to Watford Junction, via the disused Croxley Green branch. It requires 500m of new connecting viaduct and 1.5 miles of replacement track on the branch line, figures very similar to the East London Line's northern extension (and likewise involves the probable closure of an unlikely looking existing tube station). The project is not terribly exciting, completely irrelevant to Londoners, and doesn't have a great chance of happening. But it is the only extension of the tube network on the table right now.